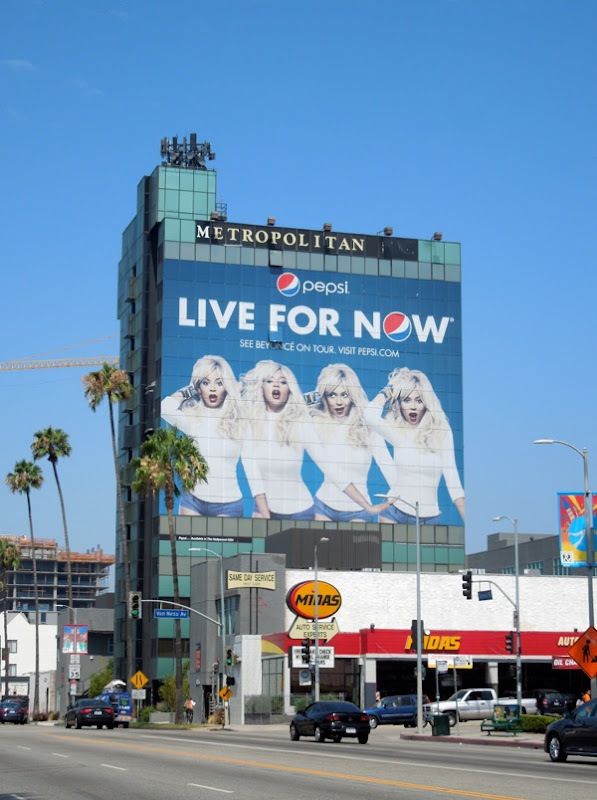 Earlier this year superstar diva Beyoncé seemed to get a lot of flak for becoming the celebrity brand ambassador for mega soda brand Pepsi, not only because of her high-profile endorsement advocating high-sugar drinks to her youthful audience, but critics also wondering if she really needed the money. 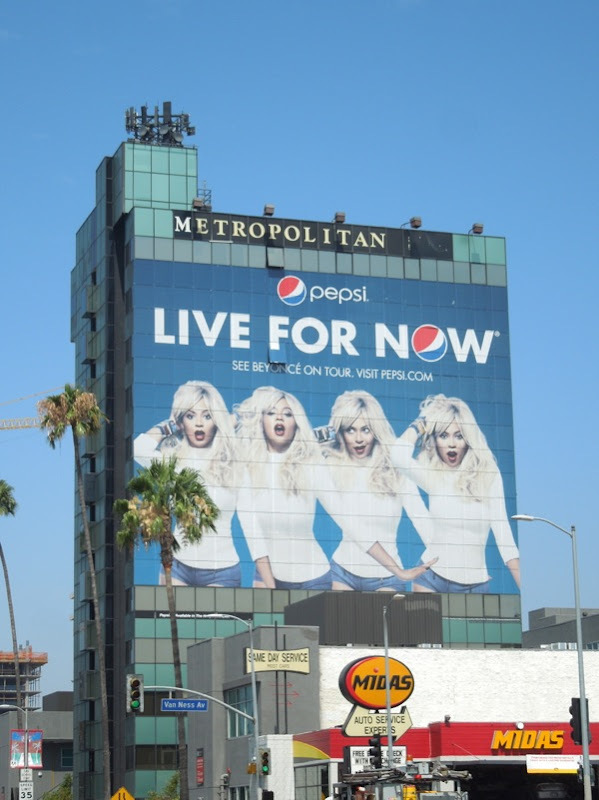 But why wouldn't the former Destiny's Child lead singer want a big brand like Pepsi to pay to advertise her solo comeback (after having her first baby) at this year's Super Bowl Halftime Show and promote her Mrs. Carter show world tour for her? Surely it's a no brainer (plus she also has H&M and MasterCard deals for additional support and visibility). 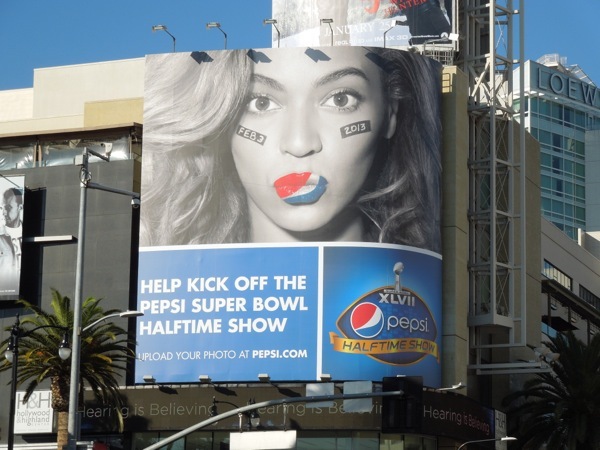 Who's benefiting the most from this endorsement deal, Pepsi or Beyoncé? Or is it win/win all around, with albums, concert tickets and soda cans flying off the shelves (and being downloaded) in their thousands. 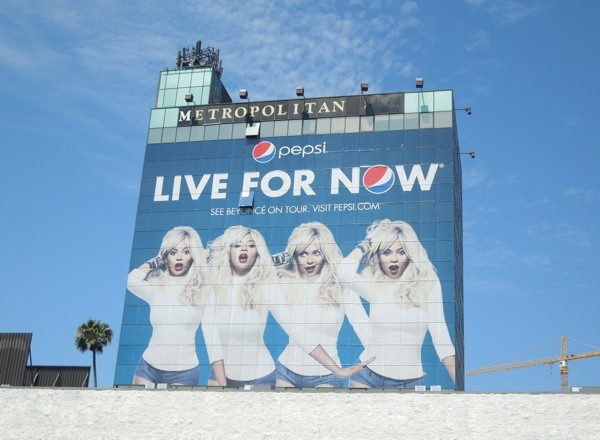 The Super Bowl 'Pepsi logo lips' creative was spied at Hollywood & Highland on January 8, whilst the many poses of Beyoncé ad was snapped on April 22 and is still there in the same location. Meanwhile the super-sized billboard was photographed on the side of the Metropolitan Hotel Hollywood along Sunset Boulevard at Van Ness Avenue on July 13, 2013. Plus you have to give the drinks giant credit, even though their logo is splashed all over the place and the songbird is wearing blue and white, there's not a can of Pepsi in sight. 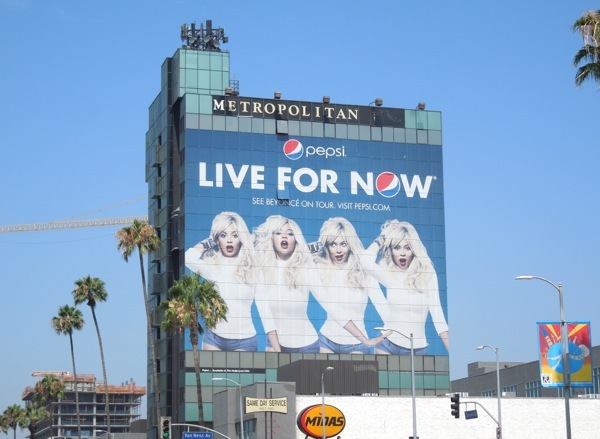 If you like these ads, be sure to also take a look at this other Pepsi Live For Now ad campaign featuring Nicki Minaj, plus more giant-sized Beyoncé billboards around L.A.